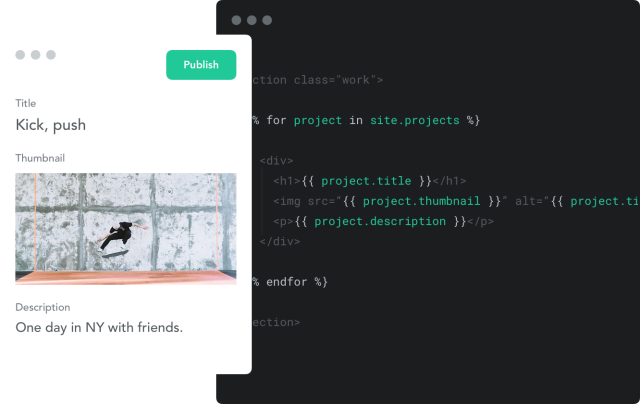 Import your Jekyll powered site and make edits within minutes. 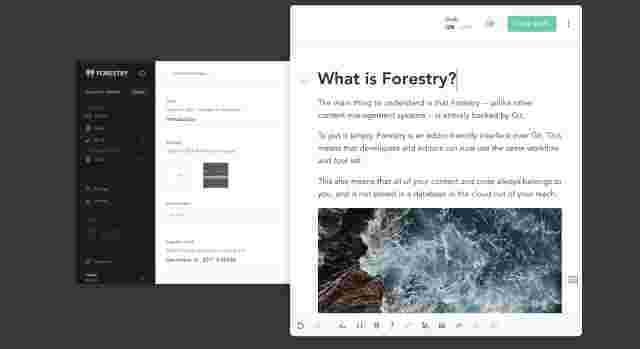 Tell Forestry what parts of your site you want exposed and configure templates to create new content. 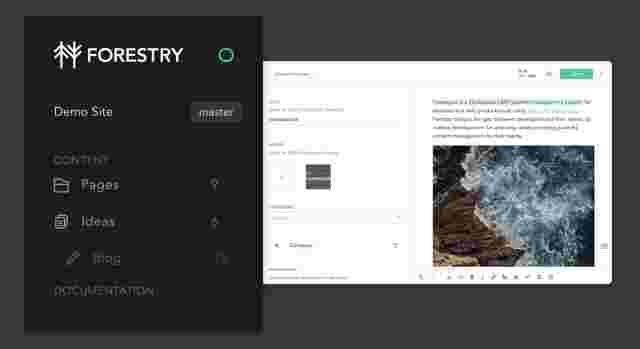 Make edits right away or create content models with Front Matter Templates. Our WYSIWYG Editor is based on Markdown and allows for seamless editing. Take the guessing out of your editing, with previews you always know exactly what your site will look like. Quickly share your project with your team and clients. Forestry can build and deploy your site to your host on every change. Further optimize the content on its way out by running gems or custom scripts. With Forestry you can provide the access to users that they need for their individual use-case. Give your entire team access to all sites in your Organization. 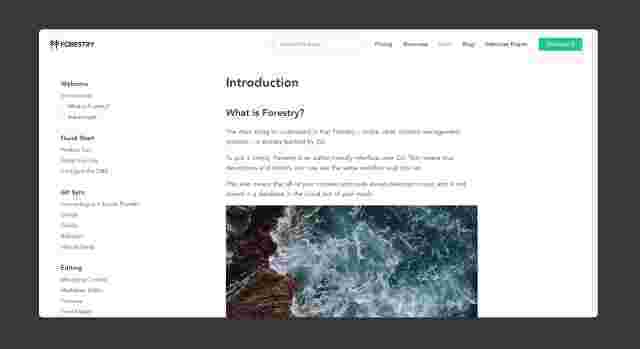 Forestry is optimized for Jekyll including Liquid, Sass and Coffeescript. Choose your own tools and include them into the build process with Custom Build Commands. Use an existing theme, create your own site or make use of a Starter-Kit. All Forestry powered projects live on Git. 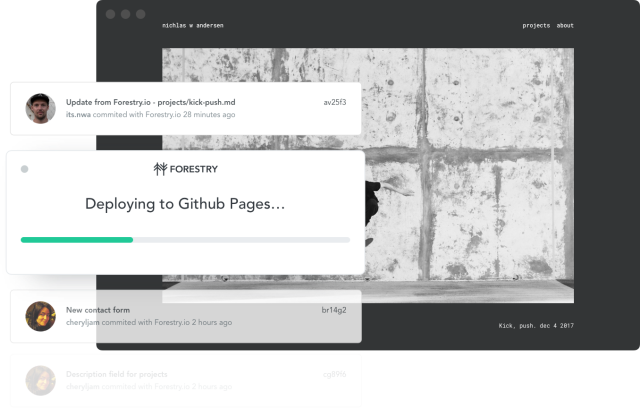 Forestry seamlessly integrates with your Git-workflow, keeping your content in-sync without merge conflicts. Your static site can live anywhere you want — including on Amazon S3, Fastly, Netlify and GitHub Pages. You can even deploy with plain old FTP. This first step imports a sample repository into your Git account and connects it with Forestry. Edit content and preview the site. Front Matter and Settings sections show how it all comes together. 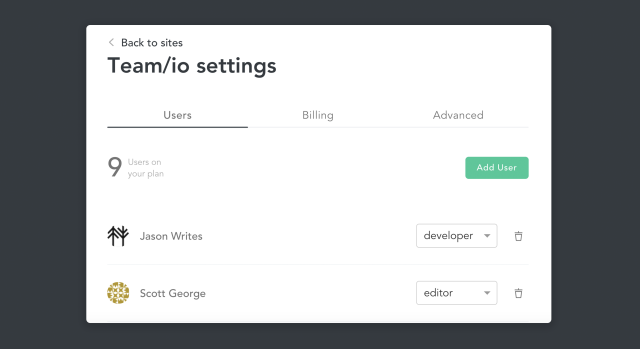 Choose a deployment method and make a change to your site to trigger your first deployment. Learn more in the "First Steps" Section (inside your project).